The Romeo y Julieta Cedros De Luxe No.3 is a smooth and rich Petit Corona Habano, 5.1” (129mm) long, of 42 ring gauge, and comes in a 25 cigars box. It comes wrapped in a thin cedar tube sporting the usual Romeo y Julieta band. A pretty underrated cigar, but favored by Cuban aficionados that like it when it is aged. Lots cedar flavors, leather and nice white pepper notes. It has a great construction, perfect draw, and burn. It is a fresh and easy light smoke, perfect for an afternoon break, both for aficionados and beginners. 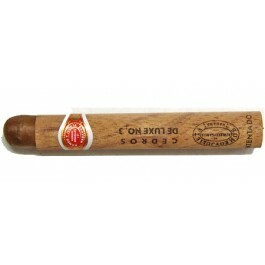 The Romeo y Julieta Cedros De Luxe No.3 is a beautifully constructed and very creamy cigar. • Nice woody cigar, there is also lots of pepper, and some notes of coffee. • Very creamy cigar, that is never too harsh, perfect for beginners. This cigar is simply a great go-to cigar, it never disappoints. The cigar is looking very classy thanks to its cedar wrapper that sports the Romeo y Julieta logo and the bane if the brand. When removing the cedar wrapper, the No.3 appears very well rolled and constructed. It has a nice dark Colorado color, it is slightly rough when touched, but it is oily and has a bit of plume. The cigar is well packed, solid and firm between the fingers. There is no soft spot. The wrapper smells of cedar. There is also some floral elements and some cream notes. Once cut, the draw is perfect, a bit tight, but nothing major. The cold draw reveals some sweet and creamy aromas, plenty of cedar, spice and honey. The cigar burns slowly, the burn line is slightly uneven, but that doesn't matter much since the draw is impeccable. The No.3 creates deep cool clouds of smoke at each puff. The ashes are pretty solid and of white to silver-gray color. The first third of the cigar is greeting you with flavors of cedar and honey mixed. There are also some floral characteristics, some pepper, some earthy notes and a bit of milk coffee. Overall, it is pretty creamy, the finish is long, but the flavors are still powerful. The body of the cigar is between medium to full body. There is no sign of the usual Romeo y Julieta fruitiness. In the middle third, the dominant flavors are of tobacco, cedar, with some peppery notes. The second third settles down, it is creamier despite strong flavors. The cigar is now medium-bodied, it is a great smoke for new comers. In the final third, the flavors are becoming a bit stronger, slightly bitter. The cedar is stronger, the white pepper also, there are also some toasty and barbecue notes. The body is still medium body. In summary, it is a very enjoyable cigar, a go-to cigar that is perfect for new-comers to Habanos. This cigar has now become my current favourite cigar. As its price is within my financial limits, I order them more frequently. I combine them with a nice cup of afternoon tea and a few biscuits with marmalade. The are the pleasant extras to my summer afternoons when sitting at the balcony enjoying my cup of tea and listen to the natural sounds around me. The first third provides a nice taste and the second thitd is not all that bad. I recommeded them to a couple of friends with a very possitive feed back.